Welara ponies are a cross between Arabian horses and Welsh ponys. They were developed by Lady Wentworth of Sussex, England. The sire was Skowronek, a Polish bred. The mares were imported from Coed Coch Welsh stud farm in North Wales. In 1981 a group of ranchers in southern California established the breed. This cross had been done for years and the offspring were thought to be exceptional. This registry was set up to recognize and benefit the Welarea Pony. Welsh Cobs are also acceptable in the breeding program. The registry has grown in the last number of years and include ponies worldwide. Welara Ponies are beautiful and refined, gentle, quick, and intelligent. They learn quickly and are versatile. They have arched necks, dished faces like an Arabian, have a high head carriage, are friendly, are strong and larger than most ponies. They range from 46 to 60 inches, have refined heads, feathered feet, good bone and stocky builds-depending on the lineage. They are quite versatile. 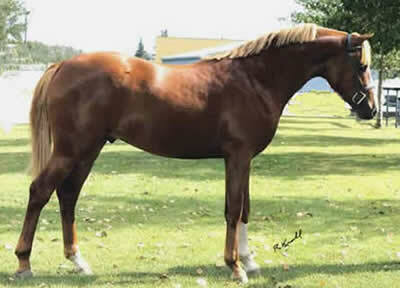 They are used for riding, competitive trail riding, harness, English pleasure, halter classes, and hunter classes.